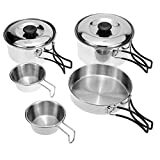 This camping cooking set includes two pots with two pot lids and small cups and one pan. Durable and convenient for outdoor camping and picnic. Made of stainless steel, easy to clean. It will be a good choice for people who love hiking, camping, picnic and party. 1The cook set will be a good choice for people who love hiking, camping, picnic and party. 1. This cooking set is advised for 1 – 2 people use. This advice is for reference only in consideration for that everyone’s food consumption capacity is different. 2. Please allow 1 – 2cm (0.4 – 0.8″) differences due to manual measurement, thanks.